Anyone can develop ankle tendinitis, but those who are not well conditioned to physical exercise may be more at risk; flat-footed individuals may be more prone to it as well. Ankle tendinitis is a condition that affects the tendon located under the bony, knob-shaped part of the ankle; it is called the posterior tibial tendon. Ankle tendinitis may occur when the tendon receives an excessive amount of stress. For example, too much stress can result from certain sports activities. Tennis, football, baseball and basketball are some examples of sports that put stress and strain on the ankles. Treating ankle tendinitis typically involves relieving pain and reducing inflammation. Often, ankle tendinitis can be treated at home. To treat ankle tendinitis at home, it is best to stop whatever activity led to the pain. This means if the patient was playing sports, he needs to stop for a period of time. Continuing with the sports activity will only aggravate the condition. For extreme cases that do not respond to home treatment or that involve severe pain, seeing a doctor is a good idea. Next, a person with this condition needs to rest his ankle for at least 48 hours, staying off it as much as possible. It may also help to put an ice pack on the area. Instead of keeping ice on the area for hours at a time, however, it may be more helpful to use an ice pack for about 20 minutes and then take it off again, repeating the 20-minute ice-pack treatment several times per day. A special ice pack or cold pack can be used if one is available. If not, the patient can make one by putting crushed ice in a plastic bag and rapping it with a towel. 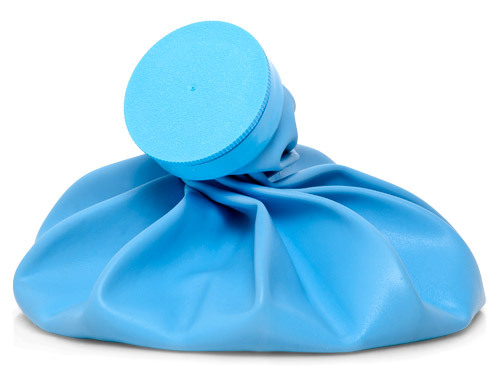 An ice pack can help with swelling and pain from ankle tendinitis. Compression may also help when dealing with ankle tendinitis. It helps to reduce the amount of swelling that the patient experiences. Special compression bandages, like elastic wraps, can work for this purpose. However, it’s a good idea to ask a doctor which type is best used for the injury. Additionally, the patient should keep her ankle elevated above heart level. Placing a pillow or two under the ankle that is already elevated on a bed, couch, or cushioned footstool can accomplish this. Anti-inflammatory medications can be helpful in treating ankle tendinitis. Generally, those that can be purchased over the counter, such as ibuprofen, should provide enough pain relief. Acetaminophen and aspirin are other over-the-counter alternatives. If these don’t provide enough relief, a doctor may prescribe something stronger after examining this ankle injury.